As of April 16, 2019, we haven't had a response from Senator Baldwin, or her office, though we were promised a response by her staff. 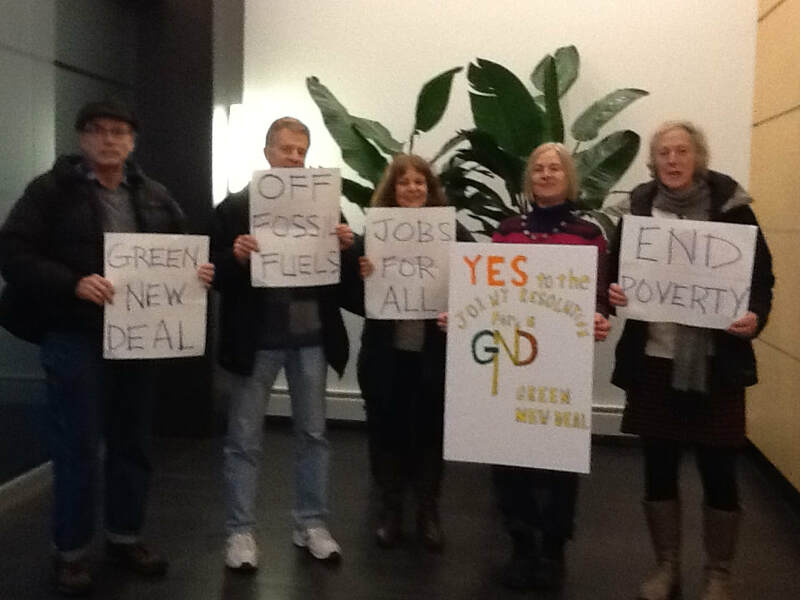 Concerned Wisconsin citizens, representing 350.org and the Sierra Club, presented approximately 1400 petitions asking Senator Tammy Baldwin to support the joint Green New Deal resolution sponsored by Sen. Ed Markey and Rep. Alexandria Ocasio-Cortez. Though there was no member of Senator Baldwin's staff available to accept the petitions or discuss Climate Change and the Green New Deal, the signed petitions, as well as copies of statements by members, were accepted at reception. A promise was made that a response from Senator Baldwin, or her office, would be forthcoming. We look forward to a positive response from Senator Baldwin as Climate Change touches on every facet of life. A recent United Nations report noted that the window of avoiding climate catastrophe is closing fast. 350 Milwaukee is the sponsoring organization of this action. ​The United Nations Intergovernmental Panel on Climate Change (IPCC) has sounded the alarm. We have a decade to prevent catastrophic warming of more than 1.5 degrees Celsius (2.7 degrees Fahrenheit), the target set by world leaders in the Paris Agreement. ​Sign the No Fossil Fuel Money Pledge taken by more than 1,200 candidates and elected officials, and refuse all donations from fossil fuel corporations. ​Serious climate policy must prioritize the frontline communities and workers left behind and endangered by the fossil fuel industry. ​The UN IPCC report, informed by thousands of leading scientific studies, shows that fossil fuel expansion is fundamentally incompatible with a livable climate. ​ Launch a congressional investigation into ExxonMobil and other fossil fuel corporations for propagating confusion and denial about the scientific truth of climate change and for hiding the risks posed by their business activities to the planet.